IBF produces concrete solutions for the Danish construction industry and since its foundation in 1960 it has been a major partner in connection with construction for companies in both the private and public sectors. There is almost no place in Denmark where you cannot see the results of collaboration with IBF. Over the years, IBF have participated in a wide variety of both large and small projects with designers, architects, engineers, contractors, municipalities and government institutions. Common to all projects is that IBF's products have helped to both beautify and improve buildings and facilities through a variety of durable quality products and discipline-specific expertise. A new era in the concrete industry began in 1960 when Johannes Rosenkilde purchased a small cement foundry in Ikast. After only a few years the space was too cramped, which was the start of the first of many expansions over the years made ​​in Ikast - both at the factory on Lysholt Allé, also where the headquarters is located, as well as F.L. Smiths Vej in Ikast Industrial Estate East (Industri Øst). IBF has grown over the years, both organically and through acquisitions. Mergers and the company’s acquisitions are usually done in the context of generational change as the industry has been dominated by family businesses. Many of these companies have over time been taken over by IBF, so that IBF is now nationwide. So far it has been possible, the companies have continued to be run by the previous owners/managers, although due to the slowdown in recent years, a few have closed and others merged. Developments have included the product areas of drainage products (pipes, well chambers, separators, etc. ), as well as curbs, tiles and paving stones, including specialty products, concrete roofing tiles and ready mixed concrete. This extension of the product range has made IBF a major and in particular, a stable player in the Danish construction industry. In the big scheme of things, 50 years may not seem very long, but in the construction industry, few can show the same continued and stable development that IBF has presented over the years. The dramatic development in the 60s meant that IBF, just as many other companies in the industry, changed from being a cement foundry into a modern industrial manufacturing company. Since the 60s, the number of members of the Danish Concrete Industry Association (Dansk Beton) has gone from approx. 450 members to less than 50 in 2010. Members' consumption of cement in the same period has increased from approx. 100,000 tons to an estimated 500,000 tons. For IBF, there have been major developments in the product range of tiles and paving stones. Today there are well over 100 different varieties compared to about 10-15 products 50 years ago. Therefore, IBF has gone through a necessary adaptation to larger units, and has gone from being a small cement foundry in Ikast to being a nationwide player, who also has factories in Poland, Romania and USA. Many factors contribute to this development and it is especially the skilled employees, modern production facilities, as well as focus on adapting to new markets and - not least - good customers and suppliers. Without these, IBF would not be what we are today. In the years after the fall of the wall, IBF saw the possibilities for selling concrete products in former East Germany and Poland. In 1992, IBF purchased an element factory in Boleslawiec, Poland, located relatively close to the border with Germany and thus allowing exports to the German market. 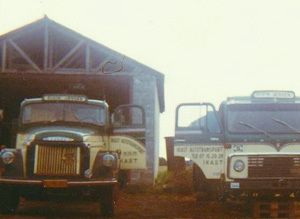 A roof tile plant, formerly at IBF's branch in Harndrup, was installed at the factory along with a production plant for paving stones. The development would, however, show that we could actually sell the production in Poland, and there was no need for export. Instead, a new market was created and this was the beginning of IBF's involvement in Poland, and it has since been expanded with a second plant in Torun, as well as five ready mix concrete stations. Yet another factory for paving stones has since been built and was ready for production in the first quarter of 2011. In 2008, a partnership began with a manufacturer of paving stones in Romania and this collaboration has subsequently evolved to having a new production plant installed. The goal is eventually to expand operations in Romania. In 2011, a partnership with a U.S. manufacturer in Houston Texas began, and this collaboration has meant that production has been modernized and a new production plant has been installed, and that Texans now walk around on IBF Products. 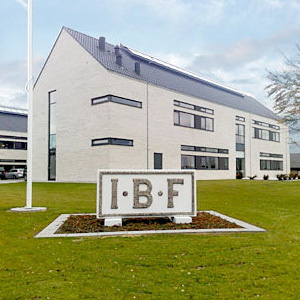 In the spring of 2012, IBF want to increase exports, so in February 2012 IBF Norge AS was formed as a dedicated sales company with an office and warehouse in respectively Tønsberg and Dal/Oslo, focusing on the sale of paving stones and tiles for public environments.